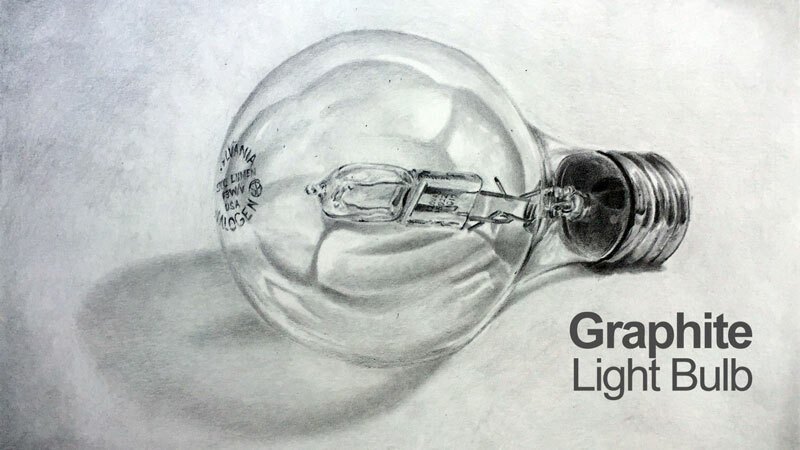 A five-part lesson series on drawing a realistic light bulb with graphite on smooth Bristol paper. Learn how to use measuring techniques to capture proportions and contours. Create the illusion of transparency and reflection through the smart use of values and shading. Smooth transitions of value and shading using blending tools and create the necessary contrast to create a convincing illusion. Great class as always Matt. Have you used the proportional dividers made by Accurasee? I picked up one the other day, but have not tried it. Seems like it would be a good tool. Thanks so much for all your hard work and dedication to the site and our success. It really shows in my opinion that you truly care if we grasp the concepts you are teaching. I’m agoraphobic and what you’re saying about fear is so true. I’m fully aware it’s my own self that had the power. I have to say the might be surprised but being in school here is helping with those fears as well as the fear of failure in my art work. As I accomplish something I didn’t think I was capable of in my art it encourages me to try something in my other areas of life that I didn’t think I could do. Sick as lately I’ve been going on walls around my neighborhood after doing my art lessons.